This week, Susan and Kitty decide the Top 10 Most Underrated DC Super Heroes! These heroes might not be the first ones that come to mind to deliver justice to the DC Universe, but they are still an important part of any super team in their own ways! Be sure to subscribe to the podcast on iTunes and Youtube, and leave a 5-star review if you enjoy the content! Your reviews are how we keep our podcast relevant and visible to other geeks in the community. Booster Gold and Blue Beetle are frequently paired together as members of the Justice League and as best friends. Gold is a futuristic hero named Michael John Carter who comes from 25th century Gotham, while Beetle, a man named Ted Kord, is a skilled intellect and excellent athlete. These two are underrated and misunderstood mostly for their rather lighthearted relationship and comedic potential as partners. Elongated Man, also known as Ralph Dibny, is one of DC’s most underrated heroes, partially due to his comical name and odd powers which are similar to Plastic Man, a slightly more well-known hero. His powers of stretching and reshaping his body come from a concentrated compound found in the “gingo” fruit, and he became famous for being one of the first silver age heroes to reveal his secret identity to the public. Elongated Man is getting to stretch his legs in live action television, though, as he is a supporting cast member of The Flash on the CW network. Etrigan the demon is an antihero created by Jack Kirby. He is the son of the demon Belial, and often speaks in rhyme- although some writers do not include this. He became bonded to the knight Jason Blood in the era of King Arthur, and Blood would become Etrigan when summoned by a certain poem. Morpheus in Neil Gaiman’s Sandman actually summons Etrigan and explains that his rhyming means he’s risen in Hell’s hierarchy of demons. He has command over hellfire, has superhuman strength, and often enjoys pain as pleasure. Deadman, also known as Boston Brand, was a former circus trapeze artist who was murdered during a performance. His spirit remained on this mortal plane, though, and was given the power to possess any living being in order to search for his murderer and seek justice for the crime. He can become intangible, invisible, and has the ability to fly as he searches for beings to take over. Deadman is often featured alongside the Justice League Dark. Terra has been the alias of several terrakinetic superheroes throughout DC Comics, but we wanted to recognize Tara Markov in particular. She was created by Marv Wolfman and George Perez with an intended finite lifespan- she was always going to be a traitor and be killed off. She was eventually resurrected as a Black Lantern, and then restored in the New 52. She’s been an ally and a traitor to the Teen Titans, making a lasting impression in the well-known story The Judas Contract. Cassandra Cain, also known as Cassandra Wayne, is one of several heroes who have assumed the identity of Batgirl, but has also operated under the names Orphan and the Black Bat. She was deprived of affection while growing up, trained to become a deadly assassin with limited social skills and virtually no literacy. She is incredibly skilled at reading body language and anticipating the actions of her opponents, making her a deadly foe and a useful ally to Batman. The Question is another hero name that has been utilized by multiple heroes. Gotham police officer Renee Montoya took over as the Question after Vic Sage died. She is a master combatant, a skilled detective, and she wears a Pseudoderm mask like her predecessor, giving her a faceless look. Alan Moore originally wanted Vic Sage as The Question in Watchmen, but when editors found out he planned to kill The Question, they asked him to create new characters- enter Rorschach. 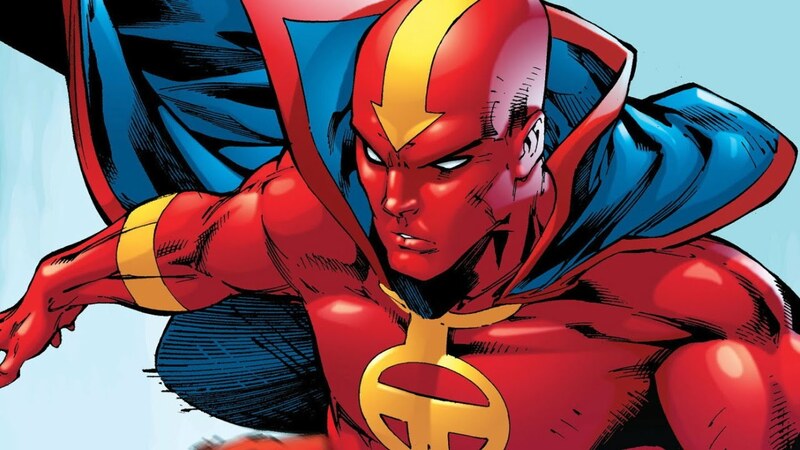 The Red Tornado is an android created by the villainous T.O. Morrow, merged with the Tornado Champion of planet Rann. He has the ability of superhuman strength, hearing, intellect, and durability, as well as the power to manipulate wind and create tornado vortexes. He has been affiliated with the Justice League of America, and was even featured in the live action Supergirl series on the CW. Big Barda is a powerful New God from Apokolips and a member of the Female Fury battalion. She was groomed by Granny Goodness to be an elite evil warrior, but when she met Scott Free- aka Mister Miracle- she fell in love and turned to good. Free and Barda reverse the typical romance dynamic, as Barda is larger and usually more protective of her husband. She is functionally immortal and has superhuman reflexes, strength, and stamina. Ava DuVernay is set to direct a New Gods film for DC, and has noted that Big Barda is one of her favorite comic characters. Also formerly known as Captain Marvel, Shazam is the heroic persona of Billy Batson, who summons the power of six immortal elders in order to transform into his alter ego. “SHAZAM” is an acronym of their names- Solomon, Hercules, Atlas, Zeus, Achilles, and Mercury. Billy’s transformation into Shazam may give him the appearance of an adult hero, but his true sense of justice comes from his innocence and uncorrupted sense of morality that comes from still being partially a child. Set to star in his own solo film soon, Shazam should not be overlooked as an important member of the DC Universe. J’onn J’onzz is one of the seven original members of the JLA and is one of the most powerful beings in the DC Universe. He first appeared in Detective Comics #255, and has since been featured in DC comics, television, video games, and animated films. Nowadays, he’s really starting to get more utilized in team-ups and DC media, and should be recognized for being one of the strongest in the DC Universe. He currently is a supporting cast member on the CW Supergirl series played by David Harewood, and will be voiced by Nyambi Nyambi in the upcoming Death of Superman and Reign of the Superman animated films. Among his many powers, Martian Manhunter can fly, and has regenerative healing, telepathy, telekinesis, genius-level intellect, and has Martian nine senses. And that’s not even the full list of his powers! Did you miss any of our previous episodes, including Top 10 Thanos Appearances and Top 10 Superhero Headquarters? You can check out the full Geek Culture Countdown podcast on iTunes. Keep an eye out for new episodes and more ways to listen coming soon.